EffOne has in depth experience in using Microsoft's .NET technology services for various applications. With our early adoption and expertise, EffOne is an ideal partner to develop your applications using .NET Technologies. Our .NET services include providing user interface, data accessibility, database connectivity, helps in Web Application Development, numeric algorithms, and also in network communications. At Effone, we aid our clients with design, development and integration of varied applications that are based on the Microsoft .Net Platform. We have experienced and skilled developers who take care of complete Microsoft functionalities by delivering perfect .Net Solutions. There are wide benefits of using Microsoft Development for designing your webpages and we help you with all of them by developing robust and powerful web applications for your online business site. At EffOne, you can experience designing and programming of your website using our expertise .NET services. Our .NET developers are skilled enough to help you with web based and stand-alone application migration to .NET. We can even update, enhance, support and develop the existing .NET applications at affordable costs than any other .NET development company online. Further, we even provide services like Windows application development in .NET, Re-engineering in existing .NET applications and porting of legacy apps to .NET apps. All our .NET services are offered by our single hub and we are providing continuous training and support to our developers for helping their knowledge in updating for the better. ASP.NET application development is an integral skill-set of the framework programmers at Effone, who are well abreast with the latest technology trends and development frameworks to provide improvised user experience as per the business requisites of our customers. Starting from analyzing, defining, developing, testing, deployment and maintenance, Effone ensures all these deliverables are reliable, scalable and 100% customized at each development stage. The ASP.NET based solutions offered allow enterprises to build cutting-edge applications that foster growth and ensure industry's best ROI. Competitive Pricing at Effone, we offer robust solutions at competitive prices. 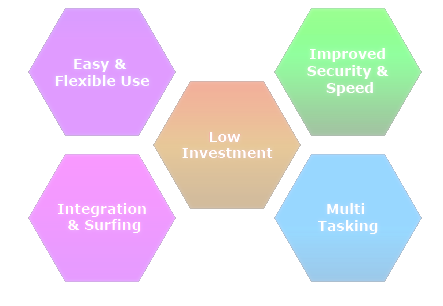 Our products and solutions are backed with performance guarantee that ensures highest ROI. CMMI-3 Processes the development processes at Effone follow CMMI Level-3 standards which ensure high-performance execution during the entire project cycle. Using the powerful programming model and extensive API set We at EffOne create business solutions that work just the way our clients want. Our custom .NET development services can help you create solutions including public and private cloud or client devices for your business context. Effone ASP.NET developers possess deep experience of creating large-scale ASP.NET web applications and high-performance ASP.NET web sites incorporating latest ASP.NET flavours such as ASP.NET 4.5 and ASP.NET MVC 4/5 along with Entity Framework . Effone has devoted itself in building Windows Azure expertise since its emergence. Effone Windows Azure developers have significant Windows Azure cloud app development experience including Azure websites, distributed applications, cloud services, mobile services, data storage applications, and Windows Azure Migration. Effone .NET desktop application development team is experienced in developing Windows GUI applications (Windows Forms or Win Forms), Windows Console applications, Windows Smart Client apps using Windows Presentation Foundation (WPF), and Windows Store Apps for Windows 8. At Effone we have been developing engaging Silverlight applications of highly interactive user experiences over the Web and mobile devices for global clients across multiple industries. Effone has several years of experience in developing apps on the Windows platform. Our developers have created unique Windows Phone 8 apps, Windows Phone 7 apps, Windows Mobile apps with great user experience and solving many a business problem. We have catered to catered to across a wide variety of scenarios using the .NET migration / Legacy Application Modernization we leverage our experience of migrating ASP to ASP.NET; VB6 to VB.NET; Java to .NET; ColdFusion to ASP.NET; .NET 1.x, 2.0, 3.x to .NET 4.0, 4.5; or many other legacy systems to modern .NET solutions. We have experienced and dedicated teams for .NET-based products customization, extension, and integration. We possess strong track records in SharePoint development, Dynamics CRM development, Dynamics RMS Development, DotNetNuke development, Umbraco development, Sitefinity development, NetSuite development, Sitecore Development, Microsoft Office Add-in development, etc. The Entities layer contains all the entities that are used in all the other projects of the application such as tables mappings from database, DTOs (Data Transfer Objects) or ASP.NET MVC Models. Most of the classes in this layer are POCO (Plain Old CLR Objects). The Data Access layer contains functionality for Creating, Returning, Updating, Deleting (CRUD) items into the database. In this layer you can use technologies like ADO.NET, nHibernate or Entity Framework. The entities or the database table mappings classes needed for the above operations will be referenced from Entities layer described above. This layer should only be shared by the Business Components layer. In Visual Studio, the layer will be represented by a "Class Library" project type. The Business Components layer contains all the core functionality of the application. The purpose is to hold all the custom logic that is applied on the methods that are exposed from the Data Access Layer before they are referenced in the Presentation Layer or the Services Layer. Operations like converting arrays to lists, mathematical calculations or variable conversions are made in this layer. The entities needed for the above operations will be referenced from Entities layer and the database operation methods will be referenced from Data Access layer. This layer should be shared only by the Presentation Layer or the Services Layer. In Visual Studio, the layer will be represented by a "Class Library" project type. The Services Layer gives you the possibility to expose the Business Components Layer as an API to third party systems. For example, if you want to share with a mobile application some data about the products that you have in your database, this layer should be responsible for that. However, this layer is not a mandatory one. If you consider that your application will not share data with another system, then this layer should not be created. As I said earlier, the methods that are needed to be exposed in this layer are referenced from the Business Components Layer and this layer should only be shared by the Presentation Layer and other third party systems. 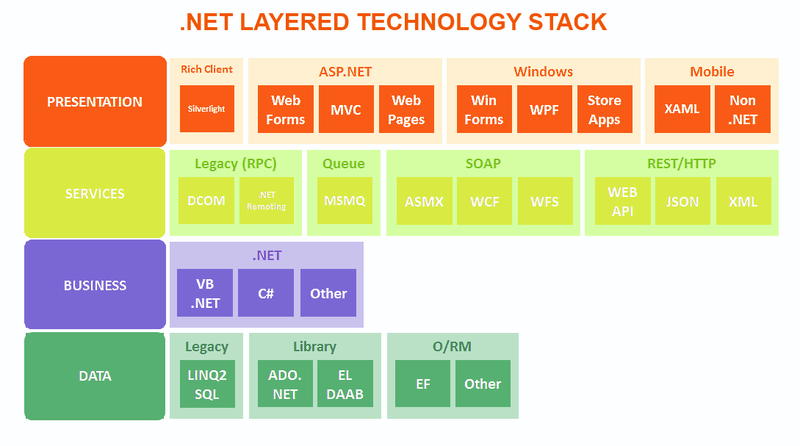 In this layer you can use technologies like WCF Services, Web Services or ASP.NET WebAPI. In this layer you can use technologies like ASP.NET WebForms or ASP.NET MVC. NOTE: Be sure that this layer is kept clean of database direct calls or direct access to Data Access layer. The Common Components Layer contains all the common libraries or functionality that can be used in any of the above layers. For example: validation functionality, security libraries, encryption tools or exception logging classes can be added to this layer. This is an optional layer and it is mandatory not to have any dependencies on the above described layers because this layer can be compiled and shared across multiple projects. 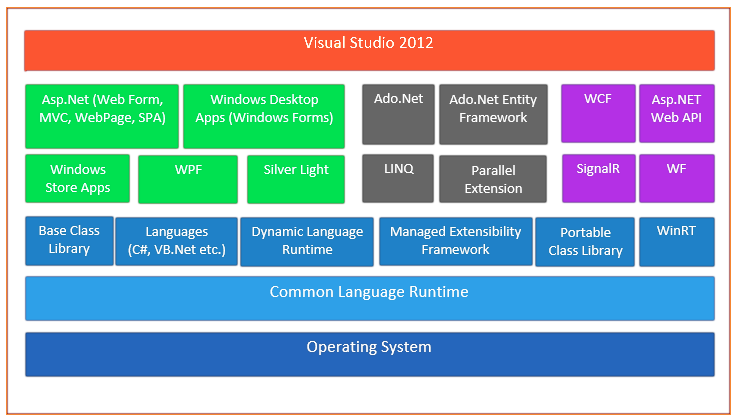 In Visual Studio, the layer will be represented by a "Class Library" project type.